Ideal for able-bodied birders or those with limited physical ability, most people will likely find a beneficial use from time to time for a product like Walkstool when viewing birds and other wildlife in the field. Walkstool is a Swedish invention and the only three legged stool in the world with telescopic legs. The first model of Walkstool was introduced onto the market at the end of 1997 and the brand has grown from there. The telescopic legs offer two sitting positions; with or without folding out the lower legs while Walkstool also boasts a small, compact and lightweight design. There are 6 different models of Walkstool. The straightforwardly named Comfort 45cm/18in, 55cm/22in, 65cm/26in 75cm/30in and the Basic 50cm/20in and Basic 60cm/24in. All models are produced in their own factory in Sweden. For the Comfort models they also offer an accessory called Walkstool Steady. 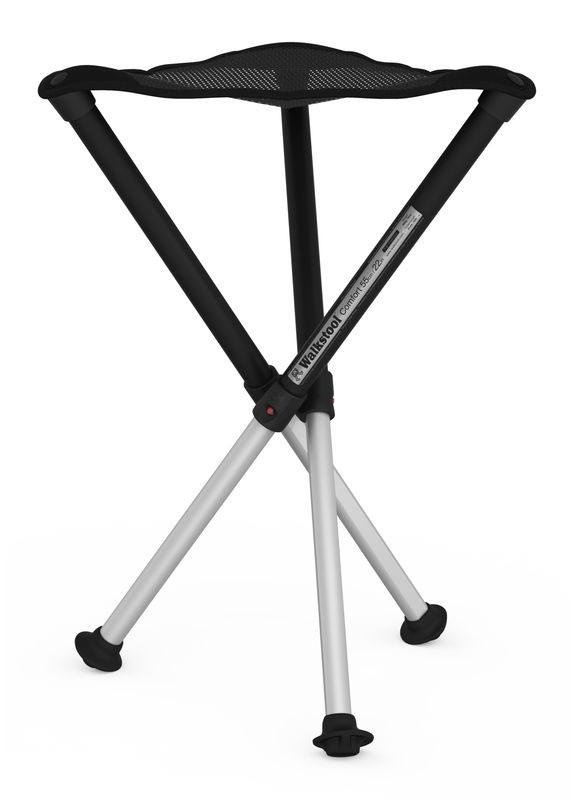 Walkstool Comfort models come with very big and comfortable seat sizes and big rubber feet. The seat is made of a black mesh material and the upper legs are black and the lower legs are of anodized aluminum in natural colour. All Comfort models come with a handsome and practical bag for carriage and storage.